The Q3 2011 GDP: How to Estimate the Impossible, Quickly! The U.S. Bureau of Economic Analysis (BEA) announced today that its estimate for the gross domestic product (GDP) for Q3 of 2011 is $15,198.6 billion, up 2.5% from the previous quarter. The GDP, along with other economic statistics, are very important in determining the health of the economy, and the policy ramifications of the quarterly estimate are the focus of much debate. The GDP is defined as the market value of all goods and services produced within the country during a given period. So, how is it possible to add up the value of all goods and services for an entire quarter so quickly? Frankly, the answer is that it’s an impossible task for such a large and complex economy, even with today’s advanced technology. Fear not, statistical analysis saves the day! Statistical methods allow the BEA to calculate an estimate of the GDP. Let's put some data in Minitab and look at how they do this to give you an idea of how much faith you might want to put into the current estimate. There are other important economic statistics, but we’ll focus on quarterly GDPs, and particularly the rate of change between them. Why Produce the Early Estimates of the Quarterly GDP? BEA calculates these estimates to give policymakers and businesses timely and accurate estimates to devise appropriate policies. Is the economy expanding or contracting? Is the rate of change increasing or decreasing? BEA’s goals are to produce estimates that are good enough so that policymakers can rely on the early estimates as accurate indicators of the state of the economy, and that policy decisions based on the early estimates don’t need to be reconsidered due to revisions to GDP estimates. They can’t afford to wait until everything has been counted. In short, there is a lot of pressure to produce accurate, early estimates, but not much time to do it! We generally think of account balances in concrete, bookkeeping terms. But BEA doesn’t have the luxury of adding everything up. It’s simply too time-consuming on such a large scale. Consequently, a large part of this estimation uses statistical methods and simplifying assumptions. Producing each estimate requires a wide mix of data, such as preliminary business survey results, manufacturers’ shipments, various indicators, and trade industry data among others. BEA calls the first quarterly estimates "Advance estimates." These estimates are released near the end of the first month after the end of the quarter. The Advance estimates are based on incomplete data and BEA adjusts much of the data by filling in gaps or by using available data as proxies for the desired measure. For example, when annual data are available and the quarterly are not, the quarterly data are often estimated by interpolation. For the periods beyond those covered by annual estimates (such as the most recent quarter), the quarterly estimates are derived by extrapolation. These interpolations and extrapolations are often based on “indicators”, which are proxy data that approximate movements of the real data. Trend projections from previous data create estimates of new data before counting even begins. Other revisions reflect the changes in the economic concepts and methodology necessary to provide a relevant and accurate picture of a constantly changing economy. At the end of each of the following two months after the first estimate, revised estimates are released that incorporate revised and newly available monthly and quarterly data. Later come annual revisions and comprehensive revisions that occur every 5 years. How Accurate Are the Early Estimates? The study found no substantial revisions in key measures over time. 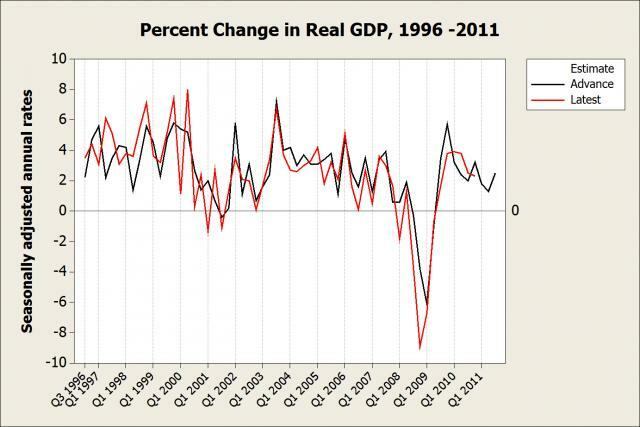 I wanted to take a look at the percent change in real GDP myself. Specifically, I wanted to compare the very first Advance estimates to the available Latest estimates. Obtaining the original quarterly Advance estimates wasn’t easy, but many thanks to Lisa Mataloni, an economist at BEA, who pointed me in the right direction! After getting the BEA data into Minitab, I produced the time series plot below. It compares the Advance estimates to the Latest estimates. There are occasions where the Advance estimates give an incorrect impression of economic growth. When the Advance and Latest estimates are on different sides of 0, one estimate suggests growth while the other suggests contraction. This happened in Q1 of both 2001 and 2008. When the Advance and Latest estimates are both on the same side of 0 but have slopes in opposite directions, the estimates give different indications for the change in growth or contraction. For instance, in Q1 of 1997, the Advance estimate suggests that the economy started growing at a faster rate while the Latest estimate suggests that growth was slowing, and vice versa for the next quarter. There have also been some large revisions. For example, in Q4 of 2008 there is the now-infamous case where the Advance estimate of -3.8% has been revised sharply downward to -8.9%. That discrepancies exist is not surprising, because the Advance estimates are published just one month after the quarter ends while the Latest estimates benefit from years of improved data, measures, and techniques. But despite the major constraints on the Advance estimates, the Survey of Current Business study found that the mean absolute revisions to the early quarterly change estimates for real GDP have averaged about 1% for 1983–2009. This is pretty small given the tight constraints on the Advance estimates! And you can see in the time series plot that, while some points are off, the overall picture between the Advance and Latest estimates is fairly similar.